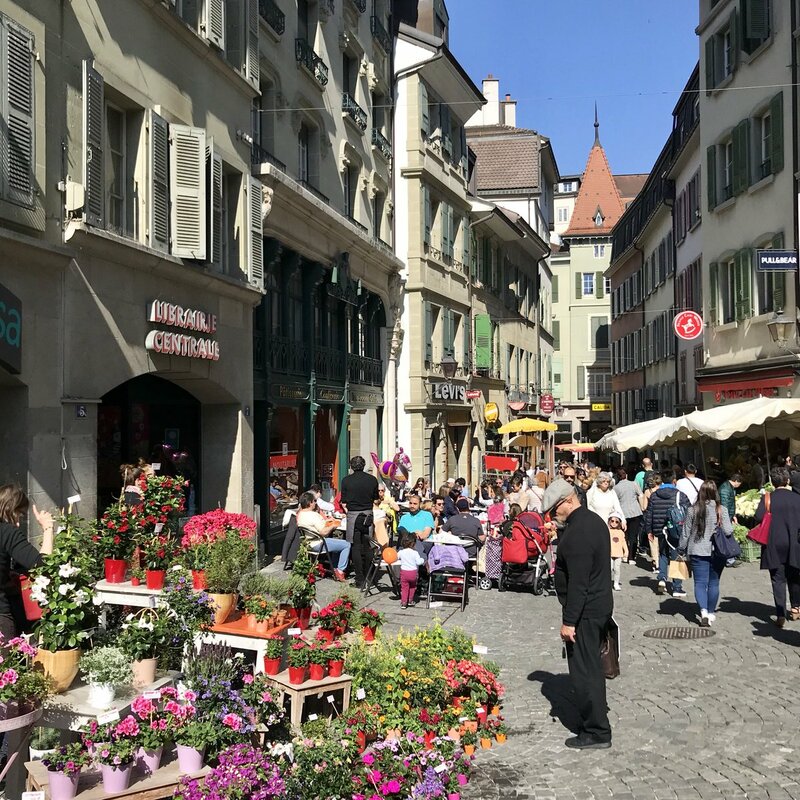 It will be 24 intensive hours, while you will discover the cobble stone pavements of Lausanne, the shores of Lake Geneva, and visit some others must-see places. Grab your most comfortable shoes, your trip in Lausanne is going to be sporty. You will need a delicious breakfast in order to kick off your trip. The Black Bird Café is the perfect place. It has lots of set menus and a long list of drinks such as coffee, hot chocolate, or fresh juices, in a charming interior. A prefect breakfast before exploring the city! Be ready, your journey just started! Close to the Black Bird Café, an elevator brings you from Bessières bus stop to the Pont-Bessières. From the bridge, you can enjoy your first view on the city waking up. Cross the bridge, and go on the street in front of the MUDAC – Museum of contemporary design and applied arts to reach the cathedral of Lausanne. There, you must see a breath-taking view on the city. Sit for a few moments and relax! The cathedral is an iconic monument of Lausanne you have to visit. Photography lovers will be amazed with the panorama from the top of the tower. So do not give up, climb the stairs that separate you from your next Instagram picture! After all this sport, just hang out in the streets of la Cité, where you can find lots of surprises. Place de la cathédrale 5A in Lausanne, the gallery La sonnette (The doorbell in English) is an Art and Design place. Just ring the doorbell to discover pictures, paintings, books, or vintage furniture chosen by two design lovers. After your walk, go down the escaliers du marché. These stairs connect the cathedral of Lausanne to the Palais de Rumine. This stately building, built in 1904, is the home of the library and numbers of museum such as the archaeological museum. Take the stairs of the palace to visit the natural history museum and meet the famous white shark. If you are hungry, you can find lots of Food trucks on Riponne place, in front of the Palais de Rumine. Do not miss the markets on Wednesday and Saturday! Keep going on your journey and follow Madeleine Street to reach Palud place. This small place is surrounded by old buildings such as the city hall. Behind the coloured Fontaine de la Justice, the Palud’s clock comes alive every hour. If you are a shopping addict, go straight to the Bourg Street. This pedestrian street and the galleries Saint-François are full of luxury boutiques. First mandatory stop: Blondel chocolats. A sweet souvenir from Lausanne that you will definitively enjoy. The Flon district is a must-see place in Lausanne. Well-known to be lively night and day, you will enjoy a unique atmosphere. Have a look to the shops, restaurants, cinema, and architecture of this modern district. To relax, let’s have a drink in one of the terrace. The morning has been sporty, so let’s meet at the Montbenon Brewery where you can admire the amazing sight while eating. And in order to digest, have a walk on the esplanade to have a look on the mountains. After the meal, let’s go to the shores of Lake Geneva. The subway M2 will take you from Flon stop to Ouchy-Olympique stop. If the weather is nice, you could have a walk on the shores while eating an ice-cream from Mövenpick. Enjoy the view on the Lake Geneva and the Alps, and explore the shores until the Olympic Museum. The sight is amazing. You could take the best pictures ever, we promise! In Lausanne, the Olympic Capital, you have to visit the Olympic Musuem. A must-see place for sports lovers and for all the family. Have fun! If the sun is shining, the CGN offers a boat Cruise on the Lake Geneva. You will discover the beauty of the famous Lavaux. A magical moment! Admire the Lavaux vineyard (Unesco) and the Chillon Castle from another point of view. To end this beautiful day in Lausanne, let’s have dinner in one of the long list of restaurants of Lausanne and then let’s have a last drink before leaving. We highly recommend you Café Bellini, Bleu Lézard, Chez Mario, Café Romand or Eat me. Anyway, there are lots of restaurants and pubs in Lausanne. Go back in the subway M2 to the Flon, and then take the bus 16 from Chauderon stop until Lake of Sauvabelin, where you could enjoy a little walk in the Sauvabelin Park. In the middle of the park, you will see the Sauvabelin Tower. Take a deep breath, and let’s go, climb the stairs up to the top and admire the sight and maybe the sunset if you are lucky. To end your day, we will bring you to the Swiss Chalet! Close to the Sauvabelin Park, the restaurant the Swiss Chalet is a very friendly place. We highly recommend you the traditional cheese fondue. So, how was your visit of Lausanne ?